I recently attended the Sixth Annual NIHR Imperial PSTRC Symposium held in London. This year the conference had a focus on using innovations in digital technology to enhance healthcare quality and safety. A keynote presentation came from Professor David Bates, Harvard University, who is an internationally renowned expert in patient safety. Professor Bates discussed the use of patient monitoring technologies on medical surgical wards where patients are not typically continuously monitored, and how such information technologies are vital to the delivery of high quality, safe patient care. Cal Leeming, Security Advisor at River Oakfield, followed to talk about the importance of cyber security which led to a thought provoking panel discussion about this topic. Next, Professor Rebecca Lawton, Director of the NIHR Yorkshire and Humber PSTRC chaired a panel discussion about enhancing patient and public involvement and engagement (PPIE) in safety. This discussion revealed many useful tips about how to engage patients and the public in patient safety research, particularly those from ‘hard to reach’ groups. Going to where the people are rather than inviting them to you, and finding a shared language, were proposed as key success factors. The discussion moved on to the interesting idea of whether PPIE is necessary for healthcare staff-facing interventions. Ultimately, as all interventions affect patients; the consensus was that PPIE is always necessary. 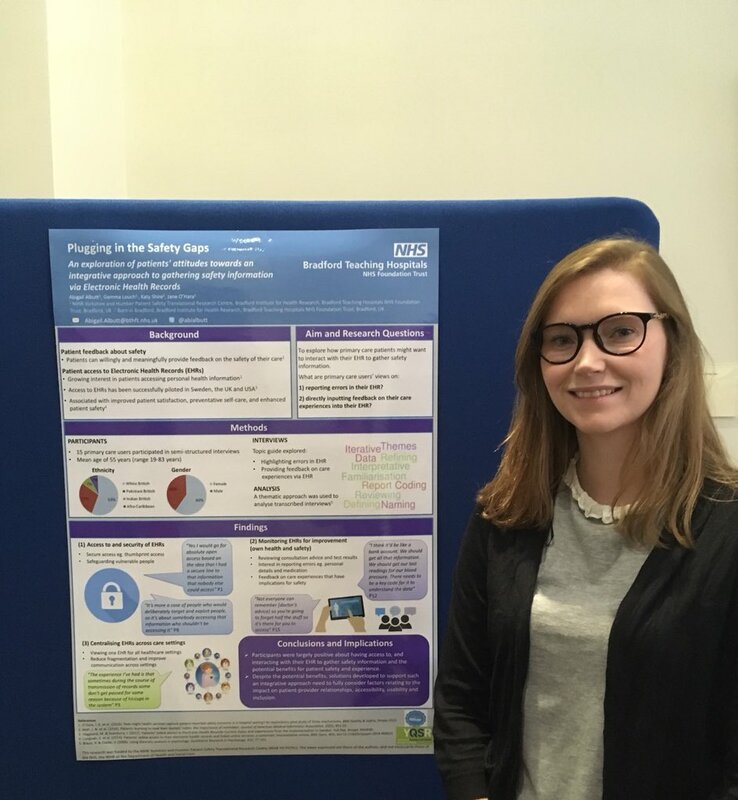 I was delighted to present a poster at the symposium, outlining one of our projects exploring how we might advance patient involvement in patient safety specifically within a primary care setting. It is now widely accepted that patients can meaningfully provide feedback on the safety of their care, and recent efforts have concentrated on novel ways of gathering this feedback. Increasingly, patients are encouraged to access their Electronic Health Record (EHR), with access associated with improved patient satisfaction and enhanced patient safety, by identifying medication errors for example. Dr Abigail Albutt at the Sixth Annual NIHR Imperial PSTRC Symposium. 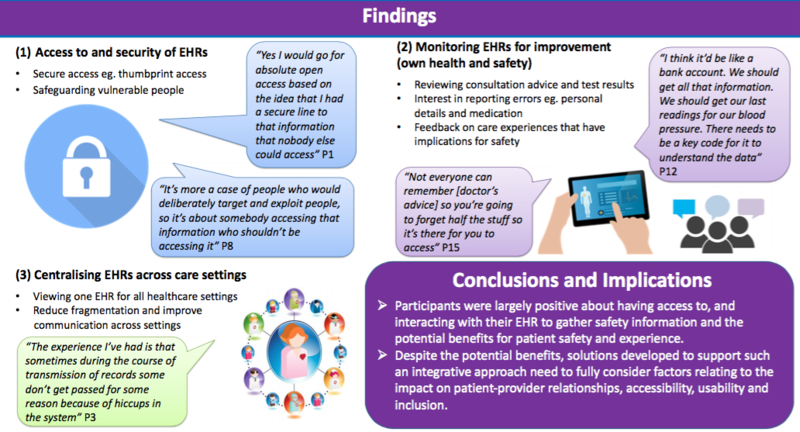 Bringing together these bodies of literature, the poster described an interview study exploring primary care user perspectives on identifying errors in their EHR and providing feedback about care experiences via their EHR. Most patients felt they would benefit from interacting with their EHR, and the majority of patients interviewed welcomed the opportunity to identify and report errors and the possibility of using EHRs as a portal to provide feedback about their care experiences. Presenting the poster generated much discussion around the process of implementing such a system in practice. These discussions reinforced the importance of the next phase of this study, talking to primary care staff, to ensure this potential integrative approach to gathering safety information from patients in primary care is acceptable to staff. I will be presenting this work orally at the British Journal of General Practice Research Conference in March which will provide a brilliant opportunity to talk to primary care staff and begin to progress the study to explore staff perceptions. This research is funded by the National Institute for Health Research (NIHR) Yorkshire and Humber Patient Safety Translational Research Centre (NIHR Yorkshire and Humber PSTRC). The views expressed in this article / presentation are those of the author(s) and not necessarily those of the NHS, the NIHR, or the Department of Health and Social Care.